Ogmore Valley and Dad and Dan This all began with a conversation between my brother Mervyn and myself and the fact that we weren’t clear about Rhys, our oldest brother’s, year of birth. I had just been in hospital, was unable to anything strenuous and ended up spending my time in front of the computer. I joined Genes Reunited because I felt a family tree, which no person in my immediate family had done, would be of use. It would certainly answer the question of when family members were born. It has now introduced me to a number of family members in South Wales , America and Australia . It is also a reflection of the 20th century and the huge changes which have occurred. It turns out that my grandfather Rees Lloyd Williams was the manager of the Ogmore Electric Light Company. The introduction of electricity and my grandfather played a part. His domestic life was a far greater reflection of the times. Between 1892 and 1900 he and his wife Hannah had seven children. Almost a child a year. I couldn’t see that happening today. 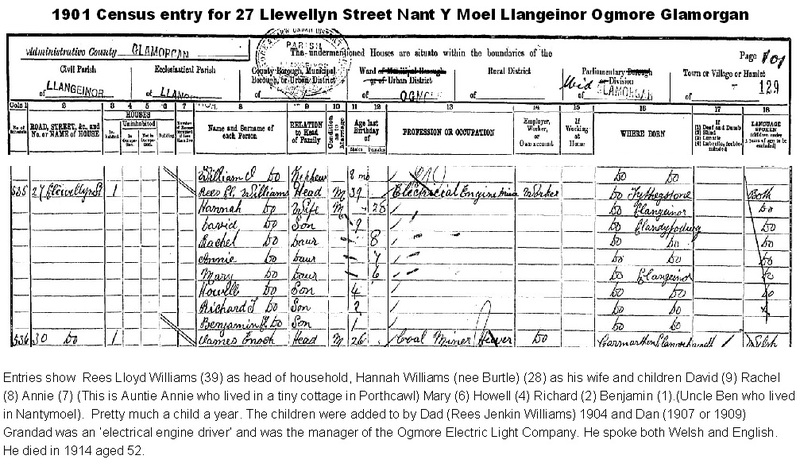 They lived at 27 Llewellyn Street Nantymoel. It almost certainly still exists today. Eventually, nine children and two adults shared that small house. When my father, Rees Jenkin Williams, was born in 1904 his mother was still unable to vote and wouldn’t be able to for another 24 years. On to my reason for joining your pages. 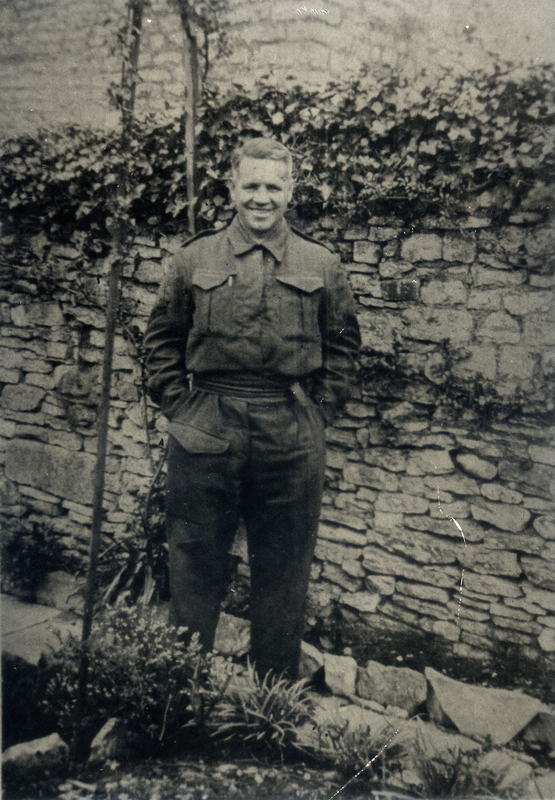 For whatever reason, although I was told by my mother that Hannah had given him an ultimatum, the mines or out, my father and his younger brother Dan Williams left the house on December 27th 1927 and walked to Bridgend where they joined the Army. They enlisted in the Kings Royal Rifle Corps and were sent to India . Most young conscripts would have gone there because those were the days of Empire. A huge change from this century. I have all my father’s Army documents, including the letter from King George awarding him the Military Medal. The Kings Royal Rifle Corps, pretty much a Valleys regiment, were instrumental in the evacuation of Dunkirk and my father was there. In fact, I know what happened to most of his brothers and sisters. I don’t know what became of Dan, his younger brother. My mother told stories about Dan and my father at Tidworth but those stories are all that I know. When he died or where he died I do not know. I intend to obtain his Army service record from the MOD archives. I also would love any photograph of the Ogmore Electric Light Company where my grandfather worked. The incredible thing about all this and perhaps the greatest change between those times and now is that I am doing this at home in front of a computer. Today I received a message from a cousin in Australia , replied to them and received a further message within the space of ten minutes. I have been in touch with my cousin Don Williams (who you will almost certainly know) and his sister Kath. All through the miracle of the computer and the internet. 82 years ago my father and his brother walked to Bridgend through valleys with working coal mines, leaving a home with a coal fire, a kettle on the hearth and scrubbed stone floors. All through their walk they probably never saw a motor vehicle. They might have got a lift on a horse and cart but that’s all. They wouldn’t know of global warming, plastic, supermarkets, motorways, television, space travel or the X Factor. You must bear in mind this was not my grandfather or great grandfather. This was my father. That is how far we have come in those years.